Transportation Costs > How Much Does a John Deere Combine Cost? How Much Does a John Deere Combine Cost? The price of a brand new John Deere combine will greatly depend on the series, options added and dealer you choose. Similar to that of a car, the costs can greatly vary, but to make budgeting easier, refer to our table below to see what the popular models “start” at. Do keep in mind these are the starting prices and often include the basic value packages. This News-Gazette.com article says you should be prepared to spend $330,000 to $500,000 if you plan on purchasing brand new. Most John Deere combines, as mentioned, are priced from $380,000 to $480,000, according to a dealer they had talked to. With add-on features, it’s not hard to reach the $600,000 price tag, either. The 2018 models offered by John Deere often offer guidance systems that can help farmers steer through the field. They are also monitored that can tell a farmer how much moisture is in the crops and even the yield figures for that particular portion of the field. Newer models, depending on the add-ons, can be equipped with brighter LED lights, built-in refrigerators, laptop computers, Sirius XM radio, heated leather seats and quieter cabs. NOTE: These are all just sample prices we acquired when playing around with the official John Deere configure tool. This is a great tool that allows you to build a combine and get an idea of what it may cost to buy new. Aside from the optional add-ons, this still won’t include the attachments, such as the corn header and/or soybean handler. Each of these attachments, again, depending on a variety of factors, can cost another $50,000 to $100,000 each. 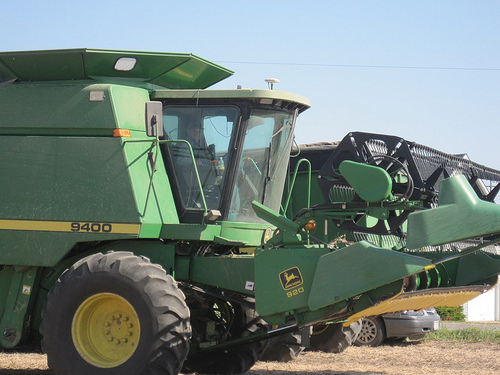 Buying used, as with any farming equipment, can save you thousands. Depending on the number of hours on the combine, older models, even one to two years old, can cost up to $50,000 less with fewer than 1,000 hours on the engine. If you were to buy a six to seven-year-old combine with more than 2,000 miles, then the costs could be up to $200,000+ less. Fastline.com, for example, offers a variety of combine listings to browse through to show you what it may cost to buy used in your area. There are often promotional discounts and trade-in incentives for those who already own farming equipment. Much like purchasing a car, be sure to talk with a few dealers to see what kind of discount you can take advantage of. If financing, be sure to check with a local credit union, online loan options and even John Deere to see which company offers the best rate.